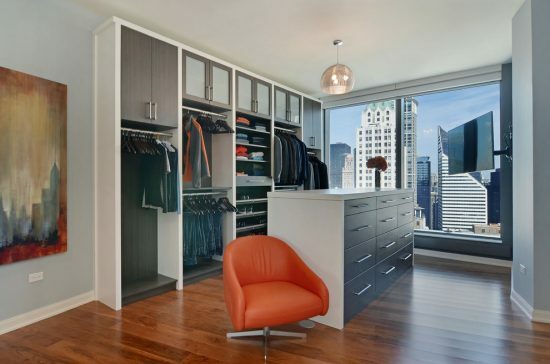 A walk-in closet in your master bedroom is a great addition to keep your items organized and keep your bedroom neat and clean which will enhance its modern or contemporary look and increase its functionality and value. You may now wonder how you could achieve that through 2016 online magazines and websites you will have a wide knowledge and variety of design tricks, and after reading also this article you will complete this vision to design your perfect creative walk-in closet. Let’s begin our creative design mission inside your walk-in closet. Above all, you have to be a smart homeowner who picks the right walk-in closet shape that fits and matches bedroom size and overall style. Then, how to organize your own walk-in closet; its colors is important to add brightness and spacious feel, so white is the best as a beautiful background and surrounded with specific lights fixtures for illumination and brightness. 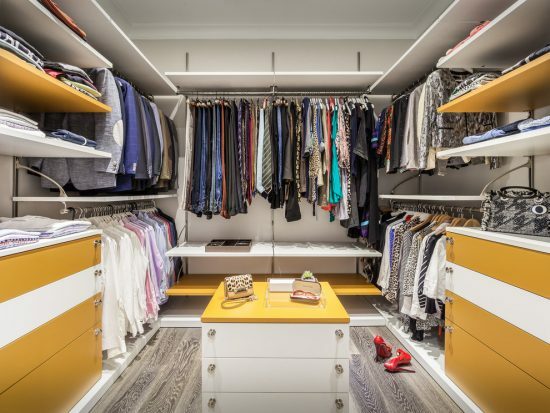 Take the most use of your walk-in closet height; this means you need to use the space wisely from ceiling to floor, don’t leave a corner or space without a creative idea to use. Custom built-in shelves could be useful to have sections and extra storage areas but it could be little expensive. As another alternative, you can go for easily changeable shelving height. You have to use the wall space also wisely which it is a creative way to keep things organized and keep your walk-in closet seem neat. There are many options to take the advantage of the wall and the overall space by using moveable hanging tools, pegboards, moveable racks, carousel and more; these items are useful for hanging small or even large items “clothes, shoes or accessories” creatively. Besides, boxes, basket and creative bin which are also useful to be used in the higher shelves for stored items. Small metal rods or hooks inside the cupboard doors are innovative ideas for your bags, ties, belts, and scarves. The creative designs of 2016 never end I intend to pick some of the useful ideas that can be useful and handy for all of us. Remember slides doors and mirrors give you more spacious look than usual. How to Have a Simple Bathroom Interior Design?